Why have Eyelash Extensions at Therapy House? At Therapy House, we offer a choice of eyelash extensions including Classic Lashes, Russian Volume Lashes, and Lash Perfect Semi-Permanent Lashes. This means that whether you want to go dramatic and bold or understated and natural, we’ve got the lashes to complete your look. Eyelash extensions offer a temporary but long-lasting way to enhance your natural lashes by attaching synthetic lashes to them. What professional eyelash extensions are available at Therapy House? We offer Lash Perfect semi-permanent individual eyelash extensions, which are the UK’s market leader and number one choice for extensions of this kind. Lash Perfect eyelash extensions come in different thicknesses, colours, curves and lengths to blends with your natural lashes exactly. We apply a clear glaze as soon as your extensions are done, giving them a soft sheen while ensuring maximum bonding between the extensions themselves and your natural lashes. Semi-permanent, you can top them up with an infill treatment every two to three weeks as your own lashes grow out in their cycle of replenishment. Applied professionally by our Lash Perfect-certified technicians at Therapy House, they’re the ideal way to achieve long, thick, beautiful lashes for 8-12 weeks at a time. You don’t even need mascara. The extensions have a natural curl and are both waterproof and durable – you can shower, swim, use the spa and sleep with them on, and the adhesive is flexible and comfortable. If you already have lots of lashes but want them to look fuller and longer, then Classic Lashes offer the perfect solution. With this option, we attach a single lash extension to each of your natural lashes. Classic lashes are available in different lengths, thicknesses and curls so we can create whatever look you want to achieve. The results tend to darken the length line, and give your lashes more curl and volume while looking subtle and natural. If you want your eyelashes to look naturally long and thick, then Lash Perfect Russian eyelash extensions are the ideal treatment. Lash Perfect extensions use the Russian Layering Technique, also known as Russian Lashes and 3D-6D, which is taking the world of eyelash treatments by storm. With Russian Lashes, we adhere layers of synthetic, ultra-fine lashes on to each of your single natural lashes to create gorgeous, natural-looking volume. 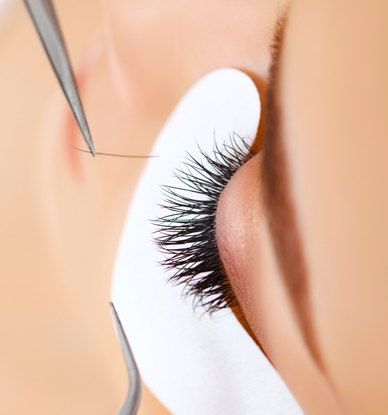 Want to know more about Eyelash Extensions?